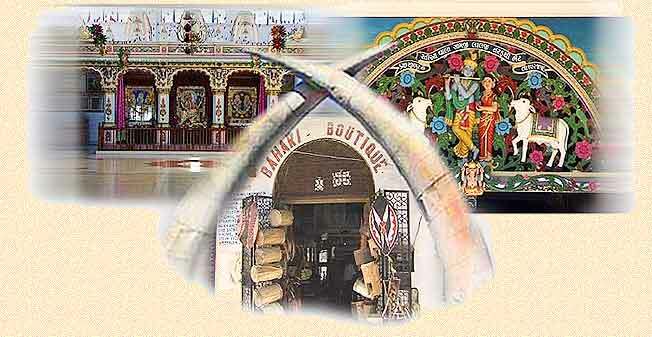 These artificial elephants tusks spanning both lanes of the main road have for decades been the symbol of Mombasa to the foreign visitors of Kenya, and thousands of postcards have taken this image around the world. Don't forget to buy some Kenyan shillings before you leave for Kenya, as most small local purchases will only accept dollars or Kenyan shillings. The average exchange rate for England is KS1000 to £1. 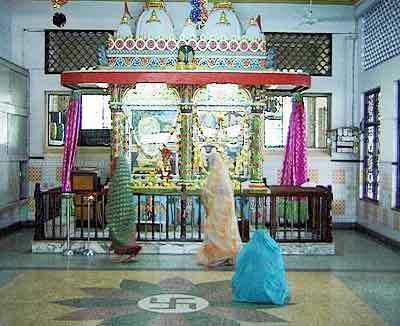 As a multi-cultural city, there are many diverse religions, predominately Catholic and Muslim, but this is a Hindu temple which is open to the public, even during worship, and here women are busy in prayer, which they do as they run around the shrine. 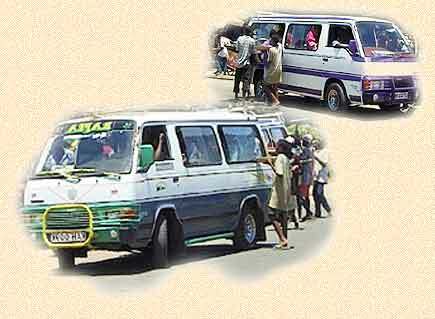 Local transport is provided by these mini vans called Matatus, which act as the local bus service. The vans are often beautifully painted and have personalised names. Passengers are offered cashew nuts and other fancies as the buses stop. Extremely cheap to ride in, they are essential for people to get to work and market, but the drivers are usually paid only on commission, and so race against each other to pick up the next fare, so be warned. 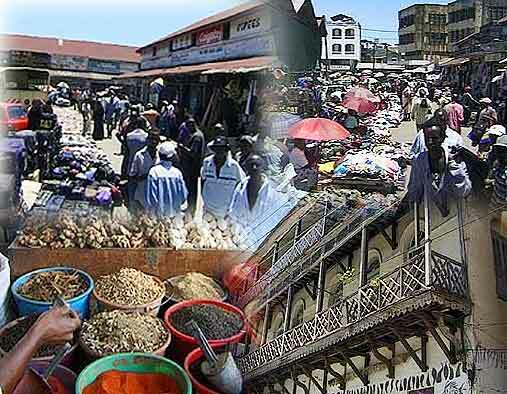 Mombasa is a huge city with a thriving community, mainly Asians and Africans, embracing widely differing architectural styles, with a large eastern influence. Built in 1593 by the Portuguese in East Africa. 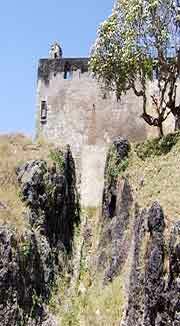 This fort was the major foothold in East Africa until 1728 when they were driven out by an Afro-Arab siege. Fort Jesus, located on the edge of a coral ridge overlooking the entrance to the Old Port of Mombasa, was built by the Portuguese in 1593 to protect their trade route to India and their interests in East Africa. Designed by an Italian architect, Jao Batisto Cairato, the Fort was his last assignment as Chief Architect for Portuguese possessions in the East, and was the 'crown jewel' of his career; the Fort is today hailed as one of the best examples of 16th century Portuguese military architecture. Throughout its tumultuous history, the Fort changed hands no less than nine times between the Portuguese and Omani Arabs. When Kenya was made a British Colony, the British government used the Fort as a prison; this was the case until 1958, when the government declared Fort Jesus an historical monument under the National Parks, and later under the NMK. Excavation work was carried out between 1958 and 1962, when the Fort opened its doors to the public as a museum. Today Fort Jesus is a popular destination for foreign and local tourists, researchers, and students. It receives hundreds of thousands of visitors a year, who come to see not only the impressive fort, but the small exhibit gallery which holds finds from archaeological excavations along the coast, and within the Fort itself, as well as a new exhibit depicting the culture and history of the coast and its peoples. Also on display are artefacts excavated from the underwater shipwreck of the San Antonia de Tana which sank in Mombasa harbour off Fort Jesus in 1697. Fort Jesus Museum is also important as it is host to numerous active research programmes, a Conservation Lab, an Education department, and an Old Town Conservation Office. There is also a museum gift shop and cafeteria, and guided tours of the Fort are available. The Portuguese built Fort Jesus in 1593. The site chosen was a coral ridge at the entrance to the harbour. The Fort was designed by an Italian Architect and Engineer, Joao, Batista Cairato. The earliest known plan of the Fort is in a manuscript Atlas by Manuel Godinho de Heredia - dated 1610 which shows the original layout of the buildings inside the Fort. Fort Jesus was built to secure the safety of Portuguese living on the East Coast of Africa. It has had a long history of hostilities of the interested parties that used to live in Mombasa. Perhaps no Fort in Africa has experienced such turbulence as Fort Jesus. Oman Arabs attacked the Fort from 1696 to 1698. The state of the Fort can be understood from the plan of Rezende of 1636 and other plans by Don Alvaro’ Marquis of Cienfuegas and Jose’ Lopes de Sa- made during the brief reoccupation by the Portuguese in 1728 - 1729. In the Cienfuegas plan, the names of the bastions are changed. Between 1837 - 1895, the Fort was used as a barracks for the soldiers. When the British protectorate was proclaimed on the 1st of July 1895, the Fort was converted into a prison. The huts were removed and cells were built. On the 24th October 1958, Fort Jesus was declared a National Park in the custody of the Trustees of the Kenya National Parks. Excavation was carried out and the Fort became a Museum in 1962. The Fort is now an important historical landmark in the East African region. The Fort Jesus museum was built with a grant from the Gulbenkian Foundation. The exhibits consist of finds from archaeological excavations at Fort Jesus, Gedi, Manda, Ungwana and other sites. Also objects are on display and were presented by their owners notably Mrs. J.C. White, Mr. C.E. Whitton and Mrs. W.S. Marchant. The Fort has lived through the years of hostilities and a hush climate and is structurally well - maintained.